White Towel Rails have been the mainstay of bathrooms and kitchens for years – providing a clean, efficient and comforting way of drying and storing towels. Today, we are happy to source and supply a massive range of white towel rails – ranging from the recognisable traditional ladder styles, right across to contemporary styles which push the boundaries of Towel Rail Design. All of our White Towel Rails have been handpicked from just a few designers. 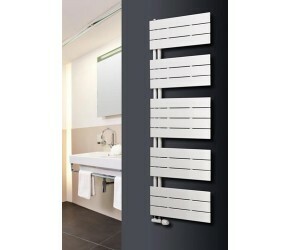 They are available in all shapes and sizes, from curved to straight to contemporary designs which provide all the function of a standard towel rail, whilst adding an excellent focal point into a room! Budget options within this range start from just £30, with prices increasing to some of our most expensive designer models which are available at around the £350 mark. As always, if you have any questions about this range – please do just get in touch and we will be happy to help.